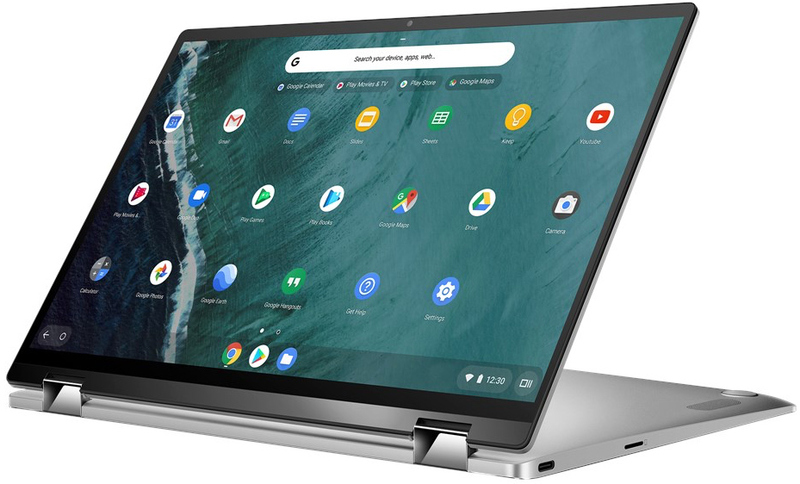 In terms of construction, the Chromebook Flip C434 is built around a CNC-machined aluminum body featuring diamond-cut edges. Overall the device is fairly petite for its size; while it measures 15.7mm thick, it only weighs in at 1.45 kg. One of the key factors enabling this are the narrow 5-mm NanoEdge display bezels, which allow ASUS to fit a 14-inch Full-HD IPS touch-sensitive LCD into a very portable chassis. Meanwhile the convertible PC also incorporates the company’s 360° ErgoLift hinge, which is specifically designed for these kinds of laptops. Unlike typical Chrome OS-based computers that use Atom-derived SoCs, the Chromebook Flip C434 runs Intel’s 8th Gen “Amber Lake-Y” Core processors with two cores and Intel’s UHD 615 graphics. While Intel’s Y-series processors offer very low power consumption, they still use Intel’s latest high-performance x86 microarchitecture with all of its advantages. The SoC is paired with 4 or 16 GB of LPDDR3 memory as well as an eMMC drive, with capacities going up to 128GB. 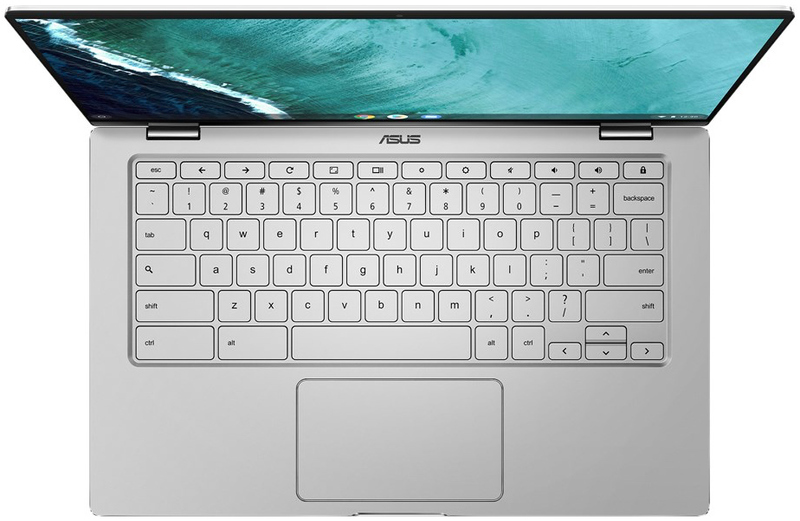 Connectivity-wise, the ASUS Chromebook Flip C434 has a rather standard set of capabilities, including 802.11ac + Bluetooth 4.0, a USB 3.0 Type-A port, two USB 3.0 Type-C ports (for data, display, and charging), a microSD card slot, and an audio jack for headsets. The PC also has a backlit keyboard with a 1.4-mm travel, an HD webcam, stereo speakers, and a microphone array. When it comes to battery life, ASUS says that the machine will work for 10 hours on a 48 Wh battery, which does not seem especially long given the fact that the PC is powered by a low-power Intel Core processor. 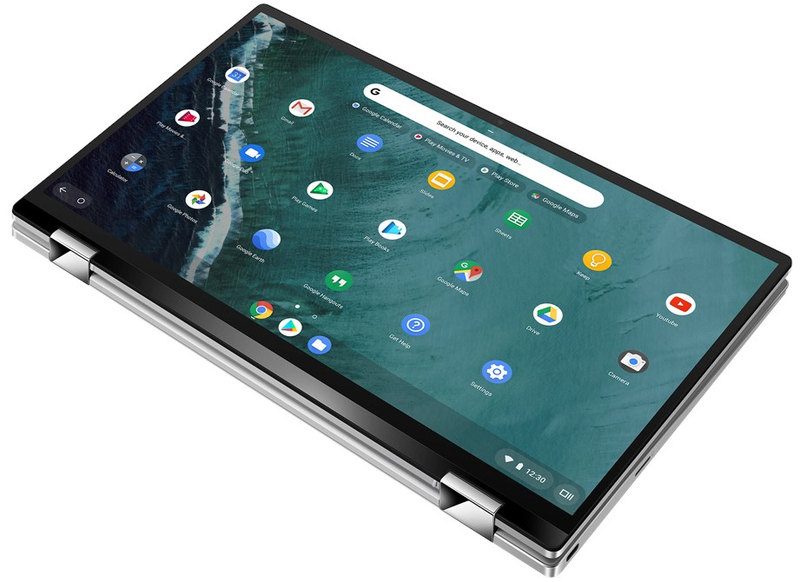 So far, ASUS is only selling the entry-level configuration for the Chromebook Flip C434, which is based on the Intel Core m3-8100Y SoC and paired with 4 GB of RAM and 64 GB eMMC storage. The system costs $569.99 at Amazon. Eventually, the company will also offer more power configurations with higher performance SoCs, more memory, and greater storage capacity. We got another durability test video from JerryRigEverything and this time the Huawei P30 Pro is the unfortunate victim. The handset went through the usual scratch, burn and bend tests and survived it all even if it got a scar or two. The back and side panels are indeed made of glass as the scratch test confirmed but Huawei made some important structural changes to this year’s design. Last year’s P20 Pro didn’t survive the bend test while the P30 Pro handled the pressure with ease. Perhaps the curved glass on the back and front add more stability and rigidity to the frame and doesn’t let the phone bend as easily. However, the curved glass does make the phone more prone to damage when dropped, for example. Thanks to the new universal app framework – Marzipan the new tracking app will come in both iOS and macOS versions. Apple is also planning to add offline tracking via a “Find Network” feature handy when a lost device is not connected to either Wi-Fi or a cellular network. Another new feature will be notifications when a friend or family member arrives at or leaves a specific location. Additionally Apple is working on a hardware tracking product, similar to an NFC tag, which you can attach on any item or device. It will be linked to your iCloud account and you’ll be notified when you wander outside the tile’s range. Alternative the tile can store specific contact, which can be read by other Apple devices. The tag’s locations will also be shareable with friends and family. Rumors about a Moto Z4 Play have been circulating for months, but now we have a plot twist – leaked Moto Z4 promo materials describe a very similar phone with mid-range specs. According to that leak, the phone have a Snapdragon 675 chipset, same as the Z4 Play, instead of a flagship 800-series Snapdragon like the Moto Z3. The promo materials claim the price will be half of what flagships cost, which solidifies the mid-range status of the phone. Both models are rumored to have 48MP rear cameras, single cameras by the sound of it. The vanilla Z4 will have a 25MP selfie camera. Both rear and front cameras will switch to pixel binning in the dark to deliver 12MP and 6MP photos, respectively, with improved quality. Is it possible that rumors mixed up the Moto Z4 and Z4 Play? We’d say it’s likely – so far there’s only one difference. The Moto Z4 will reportedly have a larger screen than the Play – 6.4” vs. 6.22”. That aside, similarities continue. Both screens are reported to have in-display fingerprint readers and teardrop notches. Batteries are the same too, 3,600mAh capacity and 18W TurboCharge support. The 3.5mm jack will live on for another year. The Moto Z4 will be a 4G phone, but will support the 5G MotoMod for those who want to try out the next-generation mobile networks.